Abdus Subhan Qureshi Alias Tauqeer, 36: Now the most wanted man in India. A software engineer from Mumbai, he worked for a leading computer firm before he joined SIMI and took to jihadi activity. He also worked as the editor of two radical Islamic magazines called Movement and Shaheen Times. An expert in bomb-making and author of the virulent e-mails that precede every bomb blast by the Indian Mujahideen, Tauqeer is believed to have masterminded most of the blasts that have occurred in the past two years. He is an expert hacker. Safdar Nagori, 38: Architect of past terror strikes and the transformation from SIMI to Indian Mujahideen. He broke from SIMI moderates three years ago to take it to the terror route. A former diploma engineer from Ujjain, Nagori has been the strongest votary of the home-grown Jihadi movement. Mufti Abu Bashir, 28: An Islamic preacher from Azamgarh in Uttar Pradesh, who also taught in a madrasa in Hyderabad, he is one of the main ideologues of the Indian Mujahideen. Till his arrest, his role was to motivate youths for the jihadi cause. He supervised the planning of terror attacks along with Tauqeer and Qayamuddin Kapadia. Currently under arrest, he is totally unrepentant about killing innocents in the blasts. Qayamuddin Kapadia, 28: A small-time trader of Vadodara, he heads the Gujarat unit. Absconding from the day Nagori was arrested, he was the main coordinator for the Ahmedabad blasts and planting bombs in Surat along with Sajid Mansuri. His role involved overseeing the purchase of bicycles and selecting the bomb sites. He is also believed to have played a key role in the Delhi blasts as a second-in-command to Tauqeer. Kapadia started the first-ever mosque of the Ahle Hadis Tanzeem (one of the two Wahhabi tanzeems) in Vadodara a few years ago. Sajid Mansuri, 35: One of the oldest members of SIMI, he had managed to give the police a slip when the Surat police caught 123 SIMI activists in 2001. He was not only the coordinator for the Ahmedabad blasts and for planting bombs in Surat but took an active part in the Jaipur bomb blasts also. The bomb that went off opposite Hawa Mahal was placed by him. A graduate in psychology, Sajid worked as a marketing executive for some time before becoming active in SIMI. Currently under arrest. Usman Agarbattiwala, 25: A PG diploma holder from Vadodara in human rights, Agarbattiwala played the most important role in the Ahmedabad bomb blasts. Pipe bombs resembling the ones which caused the Samjhauta Express blast were found from his home. Alamzeb Afridi, 24: A jobless youth from Ahmedabad who became an Islamic radical at a young age, he was actively involved in both the Ahmedabad blasts and the Delhi blasts in which he is supposed to have assisted Tauqeer and Kapadia. Absconding now, he attended the terror training camp in Pavagadh jungles in May. He purchased bicycles and then planted them in Ahmedabad after tying bombs. The Gujarat Police managed to track his secret mobile phone in the capital on the day of the Delhi blasts at three of the four locations where bombs went off within 60 and 90 minutes prior to the blasts. Abdul Razik Mansuri, 27: An embroidery unit owner, he had purchased and planted bomb-laden bicycles for blasts in Ahmedabad. His importance in SIMI can be gauged from the fact that he attended its Wagamon terror training camp in Kerala in December last year, where concrete terror plans had been chalked out. He is believed to have been involved with Afridi in executing the Delhi blasts. Mujib Shaikh, 25: A stone polishing artisan who participated in all the meetings that were held to chalk out the Ahmedabad blasts and also in SIMI’s famous Pavagadh training camp last May. An absconder, he is believed to have assisted in the Delhi attack. Zahid Shaikh, 27: A mobile phone repair shop owner from Ahmedabad and a matriculate, he played a key role in planning the Ahmedabad blasts. He too has attended SIMI’s training camp in the Wagamon jungles. His role was prominent in carrying out surveys of the spots where blasts had to be carried out. Amil Parwaz: A native of Ujjain and a close aide of Nagori who was also caught in Indore. He was present in most of the training camps that SIMI organised across the country. He is believed to be involved in the court bomb blasts in Uttar Pradesh in November 2007. He was present in Varanasi when a blast took place in a city court. There is a core group of 12 leaders, of which the only known member is Tauqeer. The others operate from the shadows and intelligence sources say that they could be working on ISI orders. They believe in the same extremist (pure) form of Islam as bin Laden and Mullah Omar. The largest group is codenamed Call of Islam. They are all over 35 years of age and number up to 60,000. They are spread across the country but are present in larger numbers in Uttar Pradesh, Madhya Pradesh, Andhra Pradesh, West Bengal and Kerala, besides Maharashtra. Many are preachers, teachers, professionals and educationists, who on the surface are law abiding citizens but issue instructions to those below them based on orders they get from the top leadership. The group below them is called Ikhwan (brothers), which has 6,000 core members. They are mostly sleepers who are activated for a particular purpose and then left alone to resume their double identities. Below them is a group of 550 members known as Ansars (helpers). All Ahmedabad and Jaipur blasts accused, besides their leaders like Nagori, are Ansars. They not just plan attacks but also plant bombs and buy the raw material for these. The next group is code-named “The White Falcon”. Their job is to enlist and indoctrinate children aged between five and 10 years in the jihadi cause. Finally, there is the group codenamed Muslim Brotherhood. They play a vital role since their main function is to raise funds through hawala and other methods, largely using Muslims serving in the Gulf countries, and keep in contact with jihadi outfits. The body has reportedly enlisted some 10 lakh regular donors, a large number of them in the Gulf countries. Year-to-year changes in the gross number of attacks across the globe, however, may say something about the international community’s effectiveness in preventing these incidents, and thereby reducing the capacity of terrorists to advance their agenda through violence against the innocent. 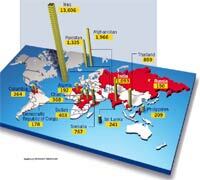 Approximately 14,000 terrorist attacks occurred in various countries during 2007, resulting in over 22,000 deaths. Compared to 2006, the attacks remained approximately the same in 2007, while deaths rose by 1,800, a 9 per cent increase from the previous year’s number. As was the case in the previous two years, the largest number of reported attacks and deaths occurred in Near East and South Asia. These two regions accounted for about 87 per cent of the 355 casualty attacks, each of which killed 10 or more people. As the chart shows, India ranks fourth in the world in terms of the number of terror strikes, after Iraq, Afghanistan and Pakistan. The Shivaji Exhibition draws Schools and youngsters alike. The Shivaji Exhibition has caught the attention of Mumbai schools. School students have been flowing in all through with their teachers guiding them through the rare manuscripts and paintings, explaining them stories from the Folklore as well as History and showing them around the various forts. The forts and the rare documents are catching the childrens’ attention for a while. Apart from the schools there have been nature clubs and hikers and trekkers with cameras comming in to shoot the panels of rare documents. A trekker I have been talking to has been vowed by the variety of the exhibition while the Nature lover wants us to do an exhibition on Environment Terrorism. There are the teachers who wnt the exhibition to stay in Mumbai and travel to their schools so that the children especially 4th class and above get a chance to see and travel through History. So by the time we are closed on 18th evening 6:30 pm the Visitors count is 4,900 and counting. See you soon Mumbai (June 20th at the King George School, now called the Indian Education Society’s Raja Shivaji High School.) and thankyou for the support.